LA JOLLA—A tiny sliver of a person’s DNA—several thousand times smaller than a typical gene—produces a molecule that has crucial influence over whether a person has any control over their muscles, according to a paper published December 18, 2015 in the journal Science. In the paper, scientists at the Salk Institute report that animals unable to produce just one of many genetic molecules called microRNAs develop symptoms of devastating neurodegenerative diseases like amyotrophic lateral sclerosis (ALS or Lou Gehrig’s disease) and spinal muscular atrophy (SMA). The findings upend previous understanding of the role of microRNAs in the nervous system and may open a door to new avenues for treating neurodegenerative disorders by correcting dysfunctional microRNAs. 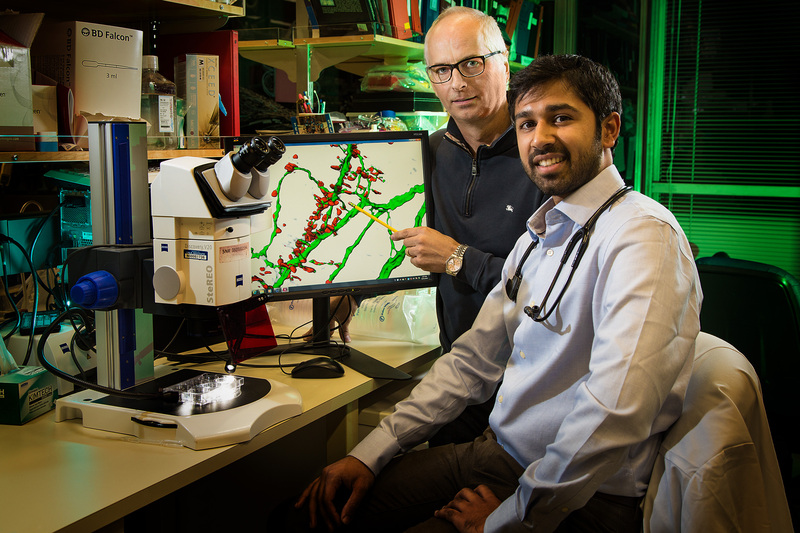 Salk scientists find mice that lack a microRNA molecule develop fatal neurodegenerative symptoms. Pictured are the synapses between motor neurons and muscle that are normal in control mice (top). In mice lacking the microRNA molecule miRNA-218, neuromuscular junctions are severely defective and motor neurons undergo neurodegeneration. Pre-synaptic motor axons are in green, and post-synaptic acetylcholine receptors expressed by muscle are in red. Areas of overlap in yellow identify correctly formed neuromuscular junctions. “This really does open a new world of possibilities to another approach to understanding neurodegenerative diseases like these,” says senior author of the work Salk Professor Samuel Pfaff, who is also a Howard Hughes Medical Institute investigator and Benjamin H. Lewis Chair. MicroRNA molecules are a relatively new point of interest in science. When the whole human genome was mapped in 2003, the genes that code for proteins—the molecules that build and regulate the body—were largely the focus of disease and basic research. Tiny “non-coding” RNAs, coined microRNAs, were first discovered in 1993 through studies in simple worms, however, their importance in humans has been less clear. But microRNAs were overlooked for years by molecular biologists because of their small size and inability to encode proteins—the critical building blocks for cells. Once microRNAs are produced, they attach to existing messenger RNAs (molecules that carry genetic decoding information) and block them from producing more proteins in the cell. The effect is like slightly turning down the volume on something that happens in the cell, rather than turning on a new channel. “MicroRNAs are not dramatic on-off switches of genes in the cell in the way we think about other genetic regulators. Instead, microRNAs are the fine-tuning control of gene activity—another reason their role in cells has been harder to pinpoint,” says Pfaff. “For a lot of reasons, the small RNAs haven’t got a lot of attention, but we were seeing clues that microRNAs deserve more attention, even though they may not be the most potent gene regulators,” says Neal Amin, first author of the paper and graduate student in the Pfaff lab. The evidence that microRNAs should be considered in more detail arose from the emerging awareness that genes involved in microRNA production were frequently mutated in patients with ALS and SMA. Using sophisticated methods to label, purify and sequence the collection of RNAs in motor neurons—nerve cells that carry impulses from the nervous system to muscles—Amin found that one microRNA in particular, called miR-218, was uniquely abundant in these types of nerve cells. “For us, that was a big red flag,” says Pfaff. In their latest paper, the Salk researchers used a new and powerful gene-editing technology called CRISPR-Cas9 to precisely snip away the tiny sections of DNA responsible for generating miR-218 in the mouse genome, their model system for studying motor neurons. The team also ran several bioinformatics tests revealing that this tiny RNA directly controlled more than 300 genes. 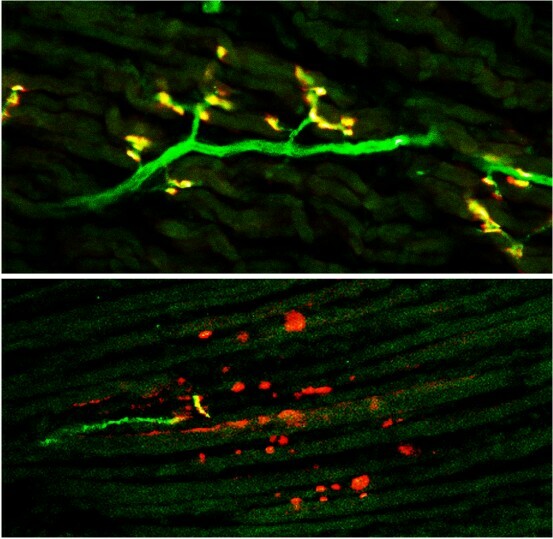 Although the mice developed their nervous system normally, it was only at the particular junction where nerve meets muscle that signals started to go awry. The motor neurons of the mice then became hyper-excitable—as is seen in ALS and SMA—before the motor neurons began to die off. Despite the strong similarities between the results in the experiment and the course of neurodegenerative diseases like ALS, the authors caution that this experiment is a first step. ALS is a fatal neurodegenerative disorder that is only inherited in about 5 percent of cases, and the majority of cases of the disease appear to result from a complex contribution of genetic and environmental causes. If future studies confirm that dysfunctional microRNAs play a role in these diseases, there is hope from other recent biomedical advances that it may be possible to restore microRNA function in cells, adds Pfaff. But the implications of the findings in this paper may even go beyond specific diseases of motor neurons. “It breaks down a few common preconceptions about what microRNAs do in the nervous system, and that opens doors for people to start studying microRNAs as a class of molecules that might have significant links to many types of neurodegenerative disorders,” says Pfaff. Other authors of the paper include Ge Bai, Jason Klug, Dario Bonanomi, Matthew Pankratz, Wesley Gifford, Christopher Hinckley, Matthew Sternfeld, Shawn P. Driscoll, Bertha Dominguez, Kuo-Fen Lee and Xin Jin, all of the Salk Institute. This research is supported by grants from the NIH, the Marshall Heritage Foundation, the Sol Goldman Trust, The Clayton Foundation and the Howard Hughes Medical Institute.